This beautiful Italian Poker chip set is admired among casinos enthusiasts and accomplished poker players alike. 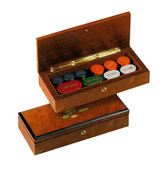 This set features an Inlaid Briarwood case with a high glossy finish and 24kt. piano hinges completed with 100 Monte Carlo Type Casino Poker Chips. The case measures 9" x 3 1/4" x 2".